From time to time, I plan to highlight books geared towards caregivers that help to promote literacy with children. I’m super excited about today’s book. 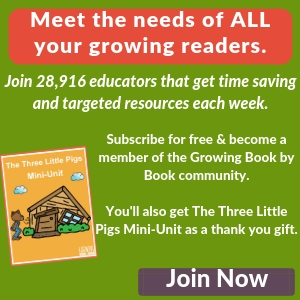 15 Minutes Outside- 365 Ways to Get Out of the House and Connect with Your Kids by Rebecca P. Cohen is a goldmine of simple ideas to promote outdoor togetherness with your children during every season of the year. In this age of technology, we tend to spend more time indoors and less time outside exploring nature. Boy, are we missing out on some great benefits of the outdoors such as sunshine, fresh air and physical activity. 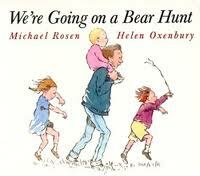 Cohen offers 365 ideas of activities to do with kids outside. Though the book’s primary purpose isn’t about developing literacy outdoors, she does offer several suggestions for doing just that. In January, she encourages you to keep a nature journal or do some star-gazing with a guide-book such as The Kids Book of the Night Sky by Ann Love and Jane Drake. In April, try gathering sticks and twigs to create your ABCs or words. As fall rolls around, let your kids do their homework outside or collect some vegetables or herbs from a garden and then follow a recipe to create a dish. I was inspired to brainstorm some other outdoor activities that could promote literacy. I hope that you will try some of Cohen’s ideas or find some inspiration below to enjoy the outdoors with children during every season of the year. Arm yourself with a digital camera and hunt for letters in nature. Develop your pictures (black and white looks best) and create word art such as your child’s first name, your family’s last name or an inspirational word. My mom created the art below to spell out our family’s last name. 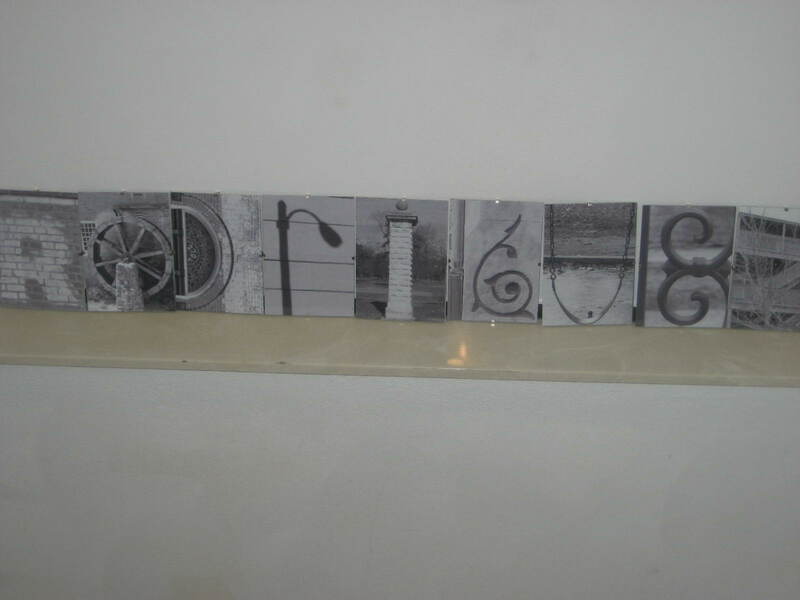 She framed each letter and then attached a magnet to the back of each frame. Jumping rope is great physical exercise. 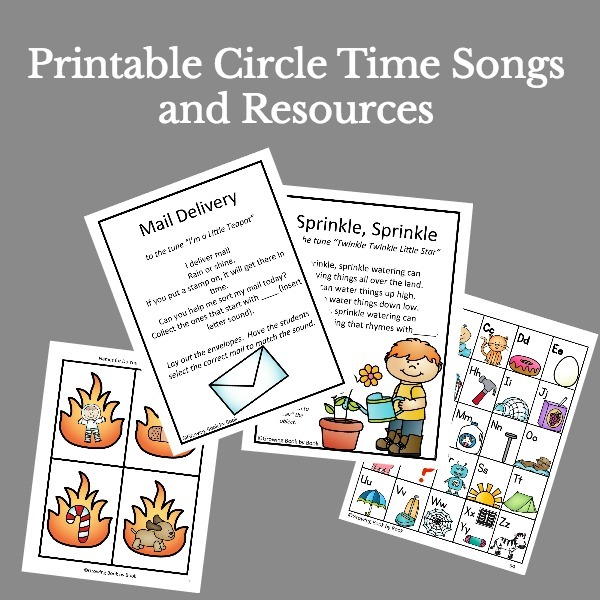 Sing a rhyme while jumping and now you also have a great literacy workout. 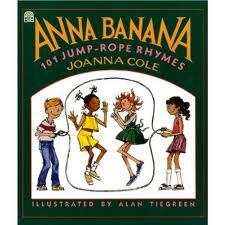 The book, Anna Banana Jump-Rope Rhymes by Joanna Cole has over 50 pages of rhymes to chant. How about this one that predicts the first letter of your future sweetheart? I remember having great fun with this type of rhyme when I was young. Strawberry shortcake, cream on top. Tell me the name of my sweetheart. There are so many great adventurous picture books that can be acted out in your backyard, in a park or on a playground. 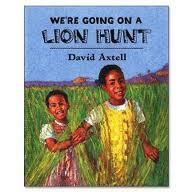 We’re Going on a Bear Hunt by Helen Oxenbury and We’re Going on a Lion Hunt by David Axtell are two repetitive tales that beg for some action movements outside. Children can pretend to swish through the grass, splash through the water, squish squash through mud and tiptoe through a cave all while searching for a bear or lion. Your youngsters could even create their own version of a We’re Going on a __________. Hmmm… Hello Toes! Hello Feet! 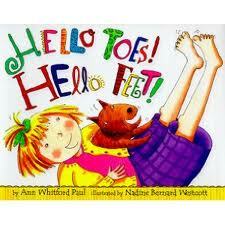 by Ann Whitford Paul is another great action story. Hopping, clumping and clomping, leaping, skipping, jumping, stamping, shuffling and creeping are just some of the great words your child will learn the difference between in this super cute tale. This book is great for vocabulary development. Time to study spelling words again? Gather a bucket, some water and a paint brush (the big painter kind- not the little watercolor brushes) and head outside. You can “paint” your words on the sidewalk or if you have brick house that works even better. If it’s really warm outside, your words will disappear like magic. Of course, sidewalk chalk also works great for this activity. Go on an alphabet scavenger hunt. Search your neighborhood for things that begin with each letter of the alphabet. A-alley, B-bark on a tree, C-cumulus clouds, D– dog and so on. When I was a 2nd grade teacher, my kids loved to take their independent reading books outside, sit on the playground equipment and read. On the next warm sunny day, why not find a cozy spot outside and unwind with a good book. Maybe you could even do this after a walk to your nearest library for some new reads. Or, you might even try taking your journal outside and do some writing. Gather some art supplies (cardstock or heavy construction paper, crayons, paint and a clipboard) and head outdoors. Create stationery (cards and letter writing paper) to send to friends and family. You could do a crayon rubbing of tree bark or paint a scene of your backyard. Stay outside or head back indoors to write a letter or card to someone special. Write sight words or vocabulary words on individual cards. Hide them throughout the yard. Now you are ready to seek them out. Have someone call out a word and then try to find the hidden word. Though I checked out 15 Minutes Outside from the library, it’s one title that I’ll be adding to my “books to buy” list! 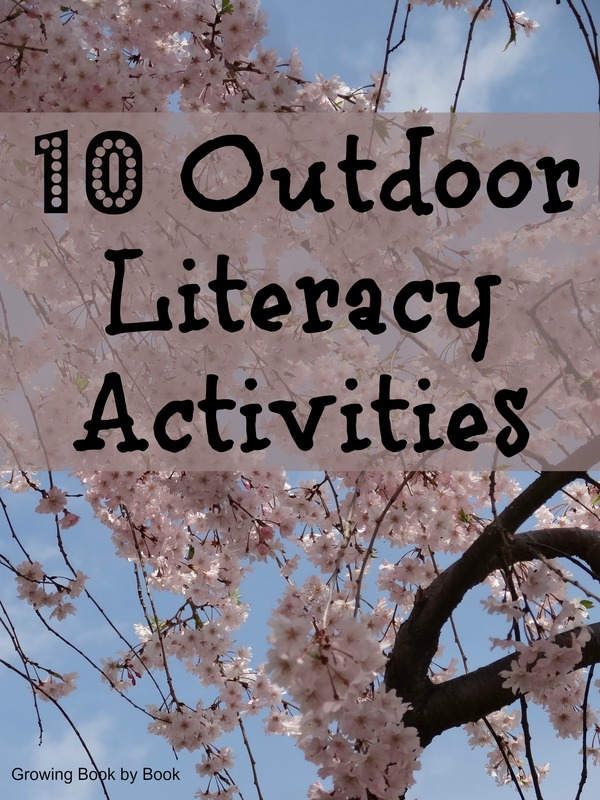 Do you have a favorite literacy activity to do outdoors? Please share your ideas. You will also want to follow our Playing and Learning Outside Pinterest board! Ever since fall began, I take my three toddlers outdoors from 11 am- 3. I bring out their buckets of toys, and they play at my feet, while I sit there with them. I bring out blankets so they can build tents. I also bring out a radio, and we listen to Audio books and the Wee Sing music CDs. They love being outside, but only if I am with them. I don’t get anything done, but they are happy, and we have good conversations as they play. Oddly enough, even though I get absolutely nothing done during the day, I feel Like I’ve accomplished more, and I feel more fulfilled. Carolyne, that is wonderful! You are building some great memories with your little ones. Thank you so much for sharing. I love the tent building idea. Thanks for linking up to the Year Round Blog Carnival. We keep 15 Minutes Outside by our backdoor – it’s so great!! Just stopping by from the Outdoor Play link up. 🙂 So glad I came across this! My son and I have been blogging about our challenge to spend 15 minutes outside every day. I loved this book and decided to begin our journey at the start of April. I’ll have to try some of your wonderful literacy ideas throughout our challenge. Thanks for sharing! Great suggestions! I especially liked the idea of water painting spelling/vocab words outdoors for older kids — that would certainly make them more interesting! Thanks for linking up to the Outdoor Play Party. 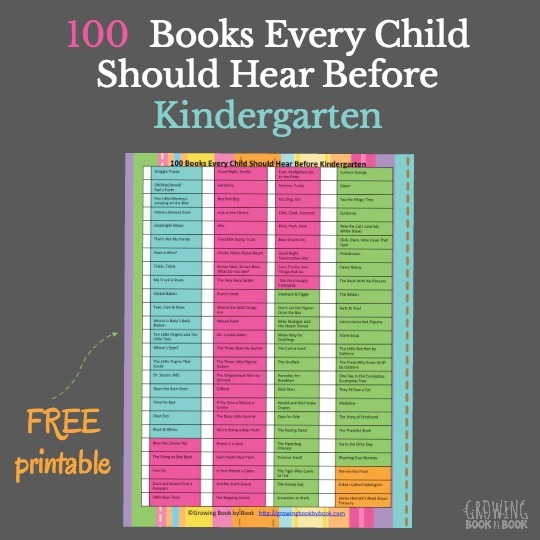 What great suggestions for playing outside with your kids and bringing literacy into the play!! Love it!! I, especially, love the idea to create stationary using outdoor art. Hi, Jodie. 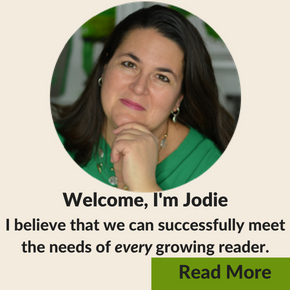 Thanks for linking into the Read & Romp Roundup. I love the ideas in your post. I, too, enjoyed singing rhymes while jumping rope when I was younger, so it’s nice to see that there is a whole book out there on that! And Hello Toes! Hello Feet! looks especially fun to me. I will have to check and see if our library has it. Thanks again for the great ideas!